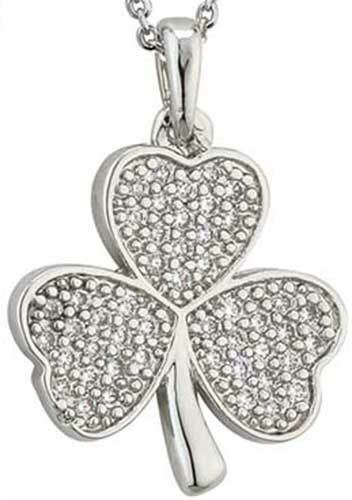 Shamrock pendant features a rhodium plated finish along with CZ stone studded leaves. The shamrock necklace features CZ stone studded leaves and measures 5/8" wide x 7/8" tall, including the jump ring and the chain bail. The shamrock pendant includes a 19" long rhodium plated chain with a lobster claw catch along wih a 2 1/2" long chain extender with a tiny tassel at the end. 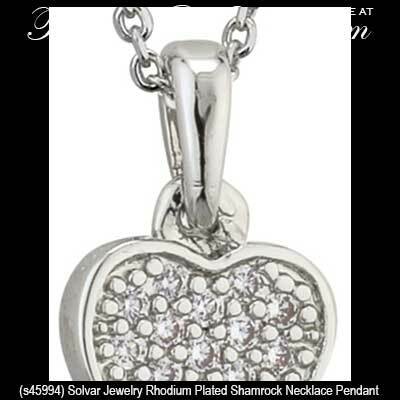 Shamrock pendant features a rhodium plated necklet design that is enhanced with CZ stone studded leaves. Shamrock earrings are rhodium plated dangle designs that feature CZ stone studded leaves. Shamrock earrings are rhodium plated studs that feature CZ stone enhanced leaves.